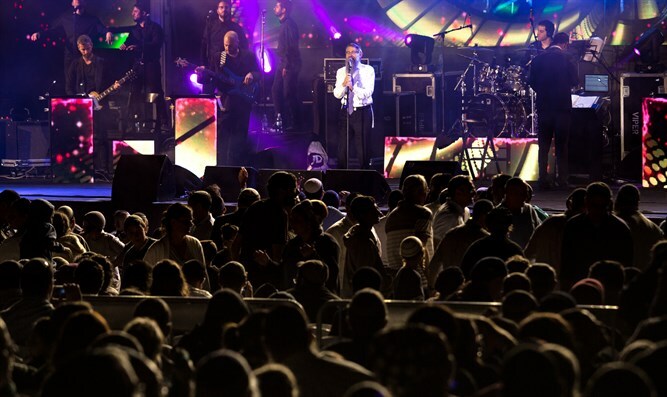 For two days next week Hasidic superstar Avraham Fried will host two artists for a special show called Lifnai v'Lifnim on the Mount of Olives. The Council of Cemeteries initiated the unique Selichot show, in which Fried will host singer Kobi Aflalo on Tuesday, August 28, with whom he has already collaborated in past large performances. The next day, on the 18th of Elul (August 29), Fried will host singer and actor Shuli Rand. Musician and conductor Yuval Stoppel produced the performance. This is another record event after the Rabbi Kook Mishmar Night Vigil held last week on the Mount of Olives to mark the 83rd anniversary of the Rabbi zt"l's passing. Jerusalem Cemeteries Council Director Rabbi Hillel Horowitz told Arutz Sheva: "There's an entire process here that took five years to rehabilitate the Mount of Olives. People stopped coming to the Mount of Olives because of security concerns. It's already the fifth year that we are in the process of restoring security and returning the people to the Temple Mount, and a dramatic change is taking place here. "It's a miracle that for three years there's been no grave desecration or stone throwing at Jews," says Rabbi Horowitz, who is careful to mention the police's contribution to the dramatic change that took place there. Prior to the Selichot performances, one should prepare and order tickets at very low prices, as space is limited. "This place is full of life of all the generations' greatest dreamers and fighters," says Rabbi Horowitz, emphasizing that "all our great activity is with the great help and partnership of the Jerusalem Affairs Ministry and the Religious Affairs Ministry and Ministers Elkin and Azulai." For details and tickets for the Selichot shows, go to the Mount of Olives website.